Hey, Nintendo: I'm going broke with all the different versions of your gaming handhelds. With this third iteration of the Nintendo DS (that's since December 2004), the Nintendo DSi tacks on a number of extra features while slimming down. It's a two-lensed digicam, it's a sound mixer...and, yeah, it still plays games on its two screens. 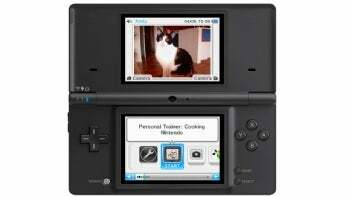 So, is the DSi worth its $170 asking price? Let's count down some of the things we love--and hate--about this new mobile gamer. And break down what it means to you. 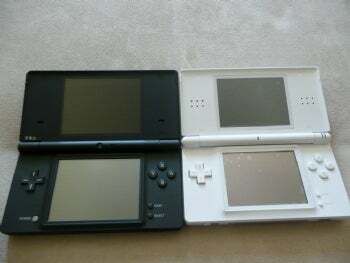 LOVE: The DSi keeps roughly the same dimensions as the DS Lite while slightly increasing the screen size (the new touchscreen measures about 1.96 inches by 2.59 inches; by comparison the DS Lite's touchscreen measures 1.81 by 2.4 inches). It has a slightly textured coating--an almost Lenovo ThinkPad-like rubbery-ish coating that makes the machine comfortable to touch.The new style puts the power button on the front face and moves the volume control to the side. All handy little changes, for sure. And it's good to finally see SDHC card support in this gaming handheld, as well. Thanks to these changes--and the removal of the GameBoy Advance backwards compatibility slot (which we'll get to in a second)--the DSi gets a hair thinner than the DS as a result. LOVE: It is a fully functional music player. Well, fully functional in that you can play back some audio formats. 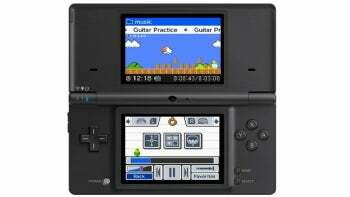 The DSi can play AAC files (with .m4a, .mp4, and .3gp file extensions). But what's gonna rope in some creative chip-tuners and budding DJs are the small audio recording and mixing abilities of the DSi. You can store up to 18 different 10-second sound bites. From there, you can add a couple of goofy effects, change speed and octave--or just have a stable of sound samples on hand whenever you're around town. Hey, you never know when you'll need to hit the Sad Trombone. HATE: So going back to what I said a few moments ago, let me be crystal clear: AAC playback. It doesn't support the MP3 format! Not even iPods are that locked down. There better be an update at some point to make that happen. I'd also love to also see more audio editing capabilities and some way to sample remix and offload the sound samples you record onto an SD card. LOVE: Two tiny 0.3-megapixel cameras (one facing outward, one pointing at the user) allow you to take pictures, while software lets you add effects and edit images. A host of crazy features enable you to do everything from futzing with faces you snap to selectively stripping out colors. Then you can take those edited images over to your computer with an SD Card. Overall, the two cameras do a servicable job. HATE: The 640-by-480-pixel resolution cameras are perfectly capable of creating something suitable for Facebook. Not that you're expecting to print family photos with these shots; also, the camera is best suited for well-lit areas--so don't expect to craft any stellar shots in a dimly-lit bar. But why do I have to keep my expectations low? $100 cell phones have better-resolution lenses. Hey, I can dream. LOVE: Nintendo finally decides to add internal storage for saving games on a device. Yay! HATE: A meager 256MB of storage. Really? I just bought an 8GB SDHC card for 20 bucks. 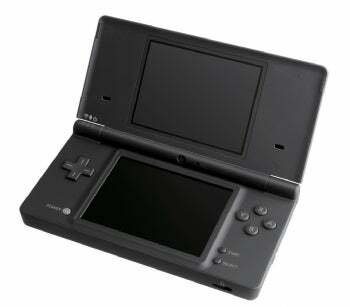 LOVE: Nintendo finally has a download store for DSi games--appropriately named the DSi Shop Channel. It's accessible on the device through any wireless Internet connection. Unfortunately, I can't tell you much more about it right now. The store doesn't open until April 5th. HATE: Applications must run off the sparse internal storage. If you download something and save it to a memory card, you'll need to copy it back onto the unit's internal 256MB of storage to run it. At least that's the way it was when the DSi launched in Japan last year. There is, however, one glimmer of hope. You see, last week during GDC, Nintendo announced a smart move: The latest system update allows you to save your downloaded WiiWare and Virtual Console games onto an SDHC card. And to play those games off the card, since the Wii has little internal storage. What a concept! Now if some rocket scienists at Nintendo are reading this--do the same thing for the DSi!! LOVE: Nintendo learned a couple of valuable lessons from the Wii. So much so that the new navigation looks like a modded, mobile version of what you'd find on the home console. Boxes that scroll along the bottom show all the features/games/applications available....and a number of open boxes await your favorite downloads. Of course, since it's so closely emulating the Wii interface, don't be surprised if there are frequent system updates to foil system hackers from crafting homebrew games. HATE: Of course, as a huge homebrew fan, the first thing that I had to do was test out my R4 cartridge (1.25 build) to see if I could play any of my homegrown games on the DSi. Absolutely no luck, it won't read the card. Now I know that the big concern about these things is that it's some gateway to pirating games. You know what? So was a VCR. So is a DVD-R. Does this mean you should punish homebrewers? OK, I'll step down off the soapbox for a sec. 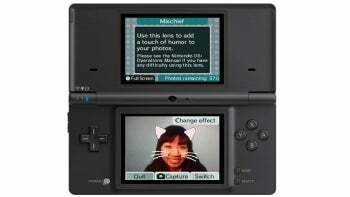 I'm not saying that Nintendo has any obligation to open up its platform (hint, hint), but it sure would be nice to see some of these freely made apps for the NIntendo DS work on a DSi. Any chance that'll happen? Well, I'll bet that some industrious modders will figure out a workaround well before Nintendo will allow it officially. LOVE: In a nutshell, it's an app store. The charm of the one-stop shop built directly into the device is fairly obvious. I'd touched upon some of the pros and cons above, but at the end of the day, it comes down to the execution. I like that it's an easy-to-navigate interface married into the operating system and software can be broken out by price (Protip: The Nintendo "exchange rate" is 2000 points for $20). Pick a game to download and cutesy animations of the Mario gang fill up a block on your DSi as it loads onto your system. Out of the initial spate of games and apps, there's one standout: WarioWare: Snapped! It sells for 500 points (about $5) and through a series of mini-games takes full advantage of the two cameras built into the DSi. Otherwise, a free Web browser (courtesy of Opera) rounds out the apps you might consider downloading. Just be warned that the free browser's Internet experience is like trying to pedal a bicycle through wet cement. HATE: Do you have a tendency to lose things? Brace yourself. Games you buy and download are linked to your DSi, not a specific account. So, if that DSi goes MIA, you're pretty much SOL. A Nintendo spokesperson tells me to think of it like one of those free refill cups. You can delete and re-download games all you like, but the second you lose your "cup," you're right back at square one - the games are gone with it. And the part that really stinks: Even if you backup your software to an SD card, it'll only work with that particular DSi. So, basically, you have a primitive, more punitive version of what Apple does with iTunes. Aside from the other points above, one "hate" pet peeve I noticed when trying to connect up over the office network: The DSi only connects over WEP. That's it. If you're a security nut, that might drive you a little nuts. And then there's the battery life. Rough testing shows that the DSi can only hang on for roughly four hours before running dry with the highest brightness settings. By comparison, the DS Lite runs like a champ, lasting almost three hours longer at its highest brightness setting. Best I can figure is that the two cameras, internal memory, and larger screens are the culprits for the extra drain. So, while I'm not a huge fan, I can understand why it's not doing quite as well in the long haul. This time around, Nintendo is definitely on the right track, but it feels like a series of half-steps. Let me run applications and games on my own SDHC cards if you're going to only supply a measly 256MB of internal memory (256MB? I can find that in cereal boxes at this point). Don't tease me with that slot and say that it's only good for stashing backup files, photos and AAC music files. And don't tell me that games I buy are gone for good if I lose the device. 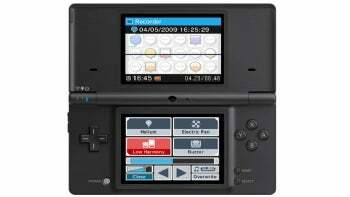 The way I see it, the DSi is one big system update shy of greatness.